Twelve hops, Tola hoe, follow Pippi on her crazy pranks and adventures. Meet Mr Nilsson, Little Gubben and Pippi's friends Tommy and Annika. Choose from 10 fun games, examples of which are: True or False? Guess Pippi if is telling the truth. Don't touch floors? Climb around Ville Villekulla, over the countertops, hat shelves, etc. The game of games? The world is full of things that need to be looked for, Pippi thinks. Here you get to do exactly what you want. No rules - just fun, just as it is when Pippi is on the move. 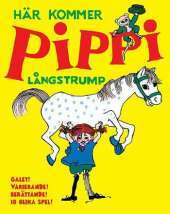 Here comes Pippi Longstocking is based on episodes from Astrid Lindgren's books about Pippi. The game is based on the original illustrations by Ingrid Vang Nyman.